To run the above code, you’ll need to have the Twilio Node helper library installed, as well as the Express framework. Absolutely! When someone texts your Twilio number, Twilio makes an HTTP request to your web app. The number of images and a URL to those images are passed via the NumMedia and MediaUrl0 request parameters respectively. If you have more than one image in the message then you get MediaUrl1, MediaUrl2 and so on. Twilio expects an HTTP response from your web app in the form of TwiML, which is a set of XML tags to tell Twilio what to do next. Before moving on, you’ll need to create a Twilio account and buy a phone number as well as having Node.js and npm installed. Now that you have the dependencies taken care of, let’s walk through the code from the beginning of the post. Here we are requiring all of the modules we are going to use in the rest of our code, creating an Express app object and adding the Body Parser middleware to it. 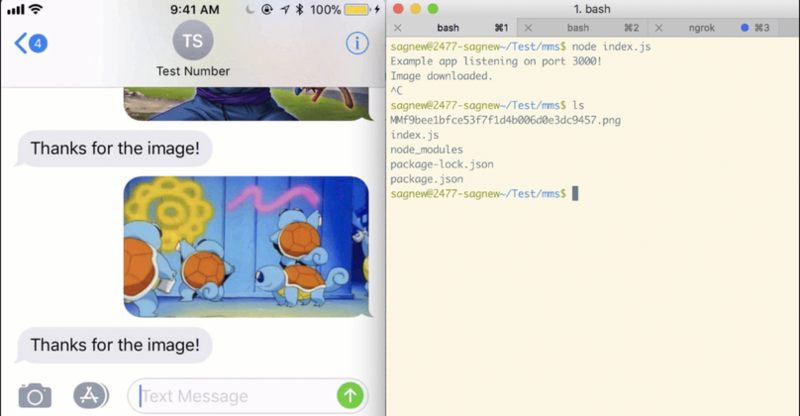 In this code, whenever a POST request is sent to the /sms route of the app, we’re creating a MessagingResponse object that generates a TwiML to respond to a text message. From the body of the request, we can grab the URL to any images contained in the message. In this example we are using MediaUrl0 and assuming there is only one image. But if multiple messages were sent, you can access those as well in MediaUrl1, MediaUrl2 and so on. In the highlighted lines, we’re sending a GET request to the media url to download the image. The response data from the media url is then being piped into a filestream and saved onto the local machine in the same directory as this code. This operation happens asynchronously. But how does Twilio see my app to send it this request? Excellent question. Our app needs a publicly accessible URL so Twilio can send it the webhook request when a message is received. To avoid having to deploy code just to test our app, we’ll use a nifty tool called ngrok to open a tunnel to our local machine. Enter the URL that was generated by ngrok. It should look something like http://your-ngrok-url.ngrok.io/sms, and don’t forget the /sms at the end! Click save, then text a picture to your Twilio number to see it download onto your machine! Why would I even want to do this? I know what you’re thinking, “Surely there are better ways to get an image from my phone to my machine” and you’re right; however, this is a necessary first step for any project that wants to be able to receive images via text messages from users to building larger projects. For example, you can do some image manipulation on the images using a library like Jimp once they are downloaded. If you want to do this in Python, you can also check this post out.